New Academic Year, New Uniforms! — Saving Children In Poverty (SCIP) Inc. The students at The SCIP ECO School are crazy cool! And we thought what better way to show their cool quotient to the world than to make sure that they have uniforms that they love wearing (and hopefully flaunting with a sense of pride) every day. With this objective, we started on a mission to design uniforms that were comfortable and something which the kids would love. Our first choice for stitching was, of course, our in-house designers, i.e. the women at SCIP Sews. Even though they struggle every day to make two ends meet, we just thought that they would know the best what their kids want. And it would generate income for these talented and hard-working women, who have faced a lot many difficulties in their life. Women at SCIP Sews, busy stitching the new uniforms! It was no wonder that when we proposed this project, everyone at The SCIP ECO School, as well as at SCIP Sews , was delighted. The first step was to find the perfect material. It is no secret that Summers in India are scorching hot (it goes up to 50C). Thus we wanted a fabric that would make sure that our kids are literally "cool" in it. So we decided to go with the ever-green (well, we didn't choose the green colour, more about it later) queen of cool -- COTTON. Next, we wanted really bright colours that would make sure that the kids look and feel "cool" in it. After a few heated discussions (hey, everyone had strong opinions on what combination of colours to choose!) the women at SCIP Sews suggested Royal Blue Shirts and Black-and-Red Checked Skirts. It looked wonderful, and everyone agreed about it. So it was a done deal. A few days ago, Kranti Sharma, an enthusiastic SCIP member told us, "Few uniforms are ready. And all the kids would be wearing them the next academic year." Our joy knew no bounds when we saw the pic. So, what do you think? Don't the kids look cute (of course, COOL) in their new uniforms? 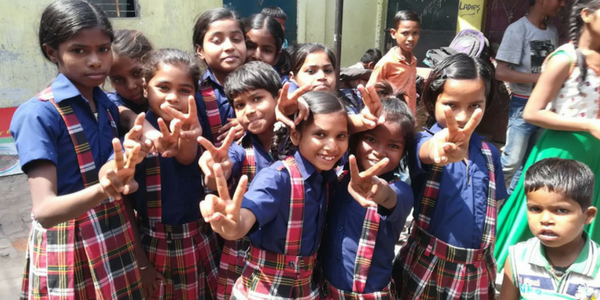 Help our honest and ethical charity by contributing a one-off and tax-deductible amount of $200 to fund a kid's education for a year!